The Ritz cracker toffee recipe is completely addictive. This homemade candy is likely to be gone just minutes after it’s finished. They call it “Christmas Crack” for a reason. The best part? You don’t have to spend hours in the kitchen to make this delicious treat. This holiday snack is easy to make and combines just four ingredients that you probably already have in your cupboards. You might want to even try the white chocolate peppermint version. The holidays are a wonderful time. Decorations, holiday parties, family, friends, and let’s not forget… the food! I for one, have a giant sweet-tooth. I always look forward to the delicious treats — like homemade Turtles — that are sure to make an appearance at each and every gathering. While the holidays are a joyful time, they are also a busy time. Holiday baking is time consuming and sometimes those parties sneak up on you before you’ve really had time to get all of your goodies made. It’s a good idea to have a go to recipe for a quick and easy treat to bring to a party. 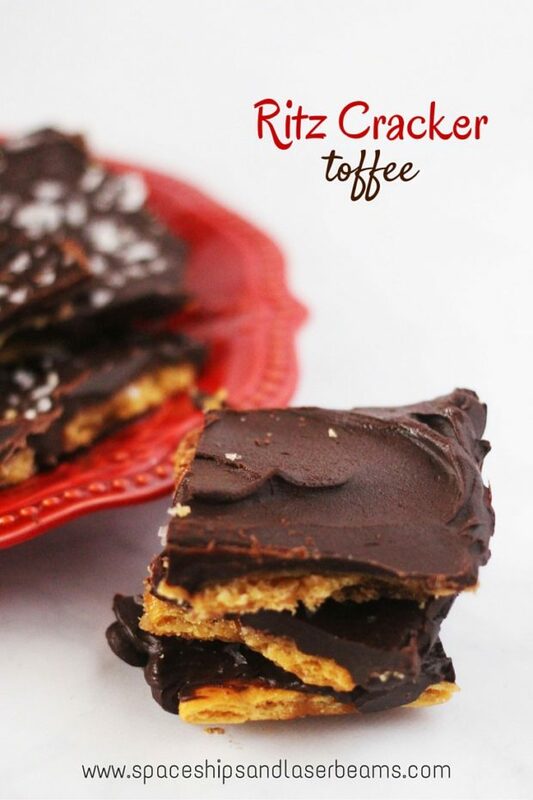 The go to recipe for me is always this Ritz cracker toffee. It’s sure to be a hit, and it only takes about 20 minutes to whip it up. When finished, you have your very own homemade toffee bark that’s easily shared. Which is good, because it would be pretty easy to eat an entire batch of this crunchy, chocolate-y goodness on your own! 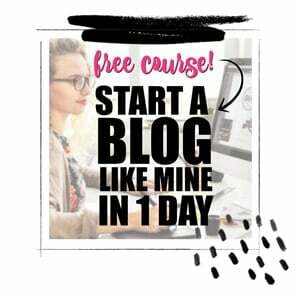 This can be a fun recipes to make as you can get creative with it. If you are a fan of sweet and salty, like us, try adding some sea salt to the top at the very end. Or, if you want to up the holiday effect, try adding bits of candy canes for a mint chocolate treat. The sky’s the limit with this one! This recipe doesn’t require many ingredients at all. You may even have all of the ingredients on hand that you’ll need to make this sweet treat. You can also choose to use other optional garnishes of your liking! I’ve even used M&Ms. This recipe is so easy to make! Just follow these simple steps. First, you’ll want to preheat your oven to 425F so that it’s ready to go when you finish putting everything together. Next, line your baking tray with parchment paper. It’s going to get sticky! Then, place the Ritz crackers in an even layer along the bottom of the pan. To fill in the small gaps you can break a cracker in half. After that, place the brown sugar and butter in a pot and heat them until they are completely melted. Let them boil for about 2-4 minutes or until it looks like the picture above. Do not stir it! 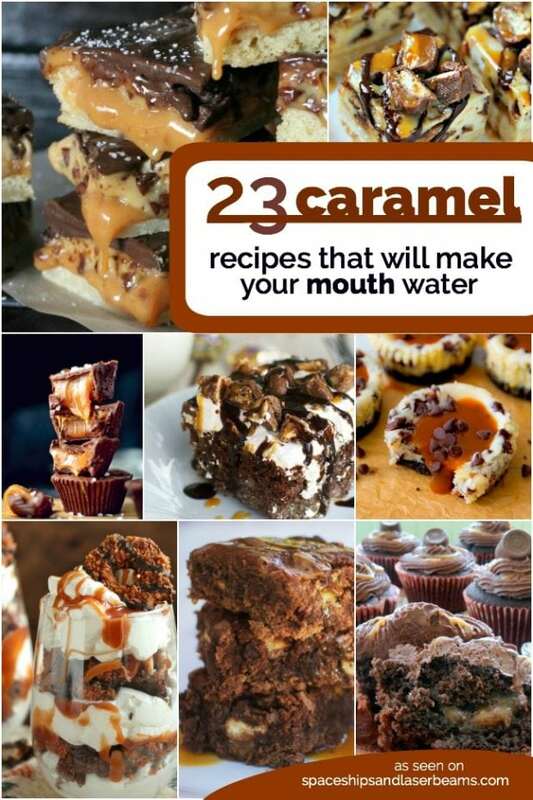 This can ruin the caramel. 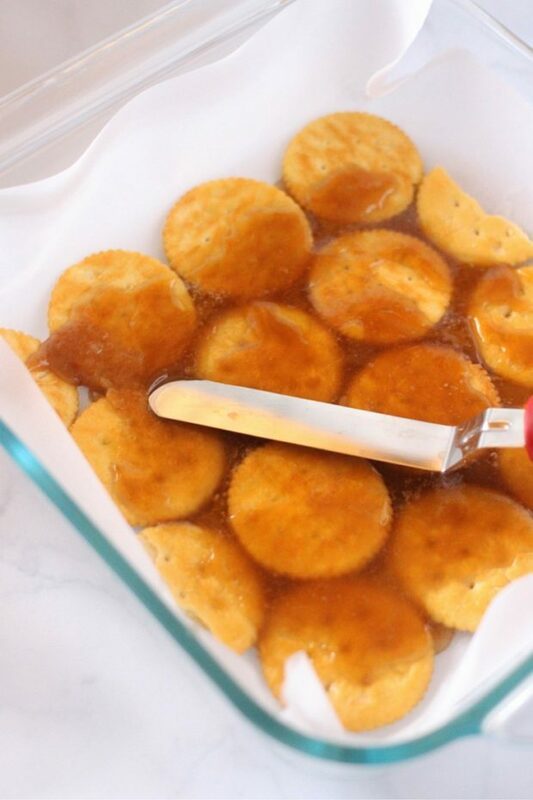 Immediately pour the homemade caramel over the top of the Ritz crackers. Use a spatula – the kind you would use for icing a cake – to spread the caramel evenly across the crackers. Then, pop the tray of crackers into the oven for about 5 minutes to help the caramel thicken and set. Carefully remove the crackers after 5 minutes and set them on a heat-proof surface for the next step. Next, sprinkle the chocolate chips in an even layer on top of the caramelized-crackers. Then, put the tray back in the oven to melt the chocolate chips a little bit. 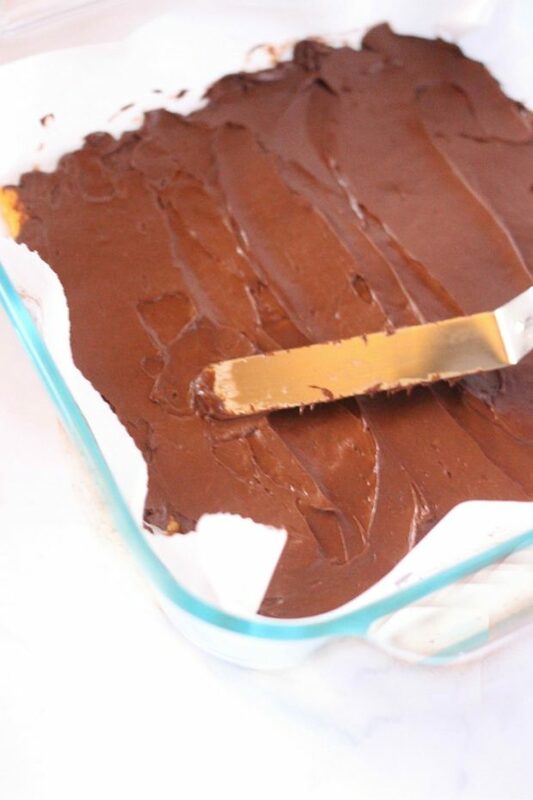 After 2-3 minutes take the tray out of the oven and immediately spread the melted chocolate chips with the spatula. They may not be completely melted but it’s better not to risk burning the chocolate and ruining what you have. Finally, you can garnish with sea salt or another ingredient of your choosing. I’ve used cream eggs, and candy corn for other seasons. Then, once the pan has cooled off, put it in the fridge to finish setting. It will get hard enough that you can “crack” it, or slice through it with a sharp knife. 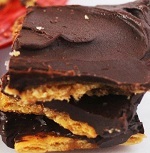 This amazing toffee recipe is totally addictive and so easy to make! Preheat your oven to 425F. Start out by lining your baking tray with parchment because this is going to get sticky! 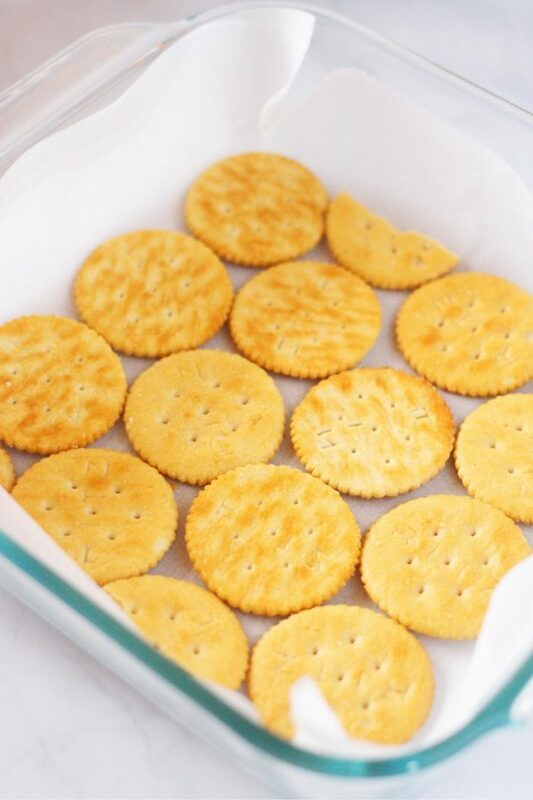 Place your Ritz crackers in an even layer along the bottom of the pan. When I had a bit of a gap, I just broke a cracker in half and fit it in. 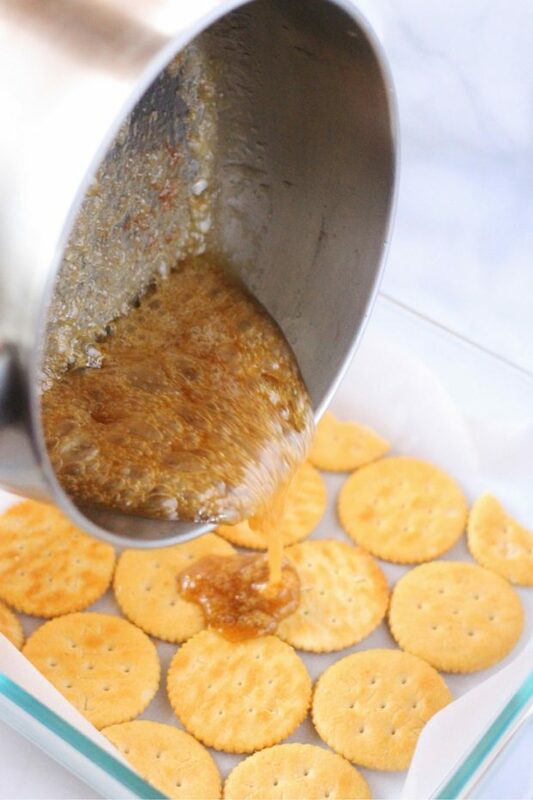 Immediately pour your homemade caramel over top of the Ritz crackers. Use an offset spatula (the kind you use for icing cakes) to spread that gooey caramel evenly across the crackers. Pop the tray of crackers into the oven for 5 minutes to help thicken and set the caramel. Carefully remove the crackers after 5 minutes and place on a heat-proof surface for the next step. 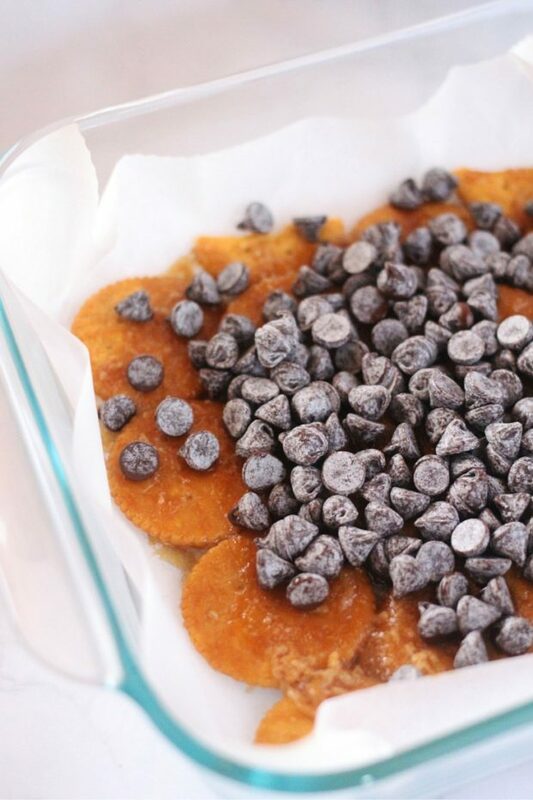 Next, sprinkle your chocolate chips in an even layer on top of your caramelized-crackers. Pop the tray back in the oven to help the chocolate chips melt a bit. After 2-3 minutes, remove the tray and immediately spread the chocolate chips with the offset spatula. The chocolate chips may not melt completely but you don’t want to risk burning the chocolate and ruining the whole pan. Optionally, garnish half the tray with a generous pinch of sea salt and once the pan has cooled enough, place it in the fridge to finish setting. The toffee will get hard enough so you can “crack” it up or slice through it with a sharp kitchen knife. Polly wants a cracker?? My kiddo loves this cracker!!! Milk chocolate or semi-sweet chocolate chips?? My preference is semi-sweet, but you might like milk chocolate better! Try both 😉 Have a great day! Is this an 8 x 8 baking dish? Wow a great snack and soooo easy to make, thank you. Have you ever tried it with slightly crumbled crackers so it filled in all the space in the pan? I haven’t done it that way, but that’s a great idea! I use Club crackers which are rectangular. Much easier. So, you don’t actually use the whole box of crackers??? Once made delicious by the way thanks ! Do you store them on the counter or in the Refrigerator?